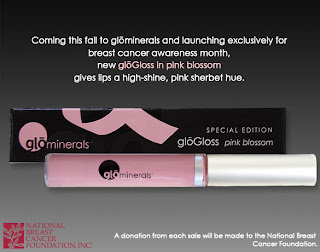 glo Beauty Blog | Makeup How-to's & Skincare Tips: Think Pink - glo minerals Pink Blossom Gloss Now Available! Think Pink - glo minerals Pink Blossom Gloss Now Available! Get pretty for the cure with glominerals gloss in pink blossom. The new shade, a high-shine, pink sherbet hue was created exclusively for breast cancer awareness. The creamy mineral formulation contains nourishing anti-oxidant ingredients vitamins A, C, E and green tea plus moisturizing safflower oil and aloe which provides vital nutrients to the lips to keep them healthy while looking beautiful. Available now! A donation from each sale will be made to the National Breast Cancer Foundation, so you'll be pretty on the inside as well as out when you purchase any pink blossom gloss. Available to professionals by calling customer service at 800-496-8007, and retails online at www.gloskincare.com.